Trnava is an important historical Slovakia city situated is western part of the Slovakia country. Every Slovak citizen knows that Trnava is called "Slovak Rome," because it has always been a centre of culture and Roman Catholic Church. The number of churches in proportion to the city area and population is quite peculiar; the city area is “scattered” by tens of church towers. Trnava houses two big universities: Trnava University and St. Cyril and St. Methodius University. The city serves as a regional and district centre. If interested, you can visit theatre, museum, gallery or cinema. Shopping lovers can take advantage of many stores and boutiques, or visit Max shopping centre with cinema called CineMax. Popular McDonald you will find in the city suburbs. Visitors usually do not have parking problems as there are many car parks located right in the town centre. City Bus and Train stations are situated only few minutes walking from the centre. You will come straight to Trojičné Square, where you can relax on terraces having a cup of coffee and enjoy the city’s delightful atmosphere. Discovering Trnava’s beauties you should start in the historical city centre. It is surrounded by a fortification erected to protect the city against enemies. The 0.93mi (1.5km) long fortification wall has preserved up to the present time, mainly in the western and eastern parts of the historical centre. It was originally 26- 32 ft (8-10m) tall and 9.8 ft (3m) wide. Built in the thirteenth century, it has been reconstructed several times and nowadays it is an important historical monument. The city fortification is situated just behind St. Nicolas’ Cathedral. If you continue walking, you will find a footbridge that connects historical city with modern residential areas. 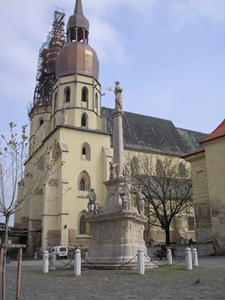 St. Nicolas’ Square and St. Nicolas’ Cathedral are the oldest historical sites in Trnava city. St. Nicolas’ Cathedral annually hosts an organ music festival. It was constructed in the fifteenth century. This originally Late Gothic three nave basilica served in years 1534 till 1820 as Archbishop of Ostrihom’s seat. A Virgin Mary painting famous for crying in time of the Turkish invasion in 1663 is hanged in the basilica’s chapel. The painting cried again in 1708. An Archbishop’s Palace is located besides the Cathedral. An important historical monument called Oláh Seminary, today’s home to a Museum of printing culture, is located just opposite to the Cathedral’s main entrance. A House of Music with a commemorative room of a musical composer Mikuláš Schneider Trnavský is situated nearby the Seminary. It is also home to one and only Museum of resophonic guitars in entire Europe. Trojičné Square is another nice and interesting historical site you must see in Trnava city. From the St. Nicolas’s Square you just have to walk along a narrow street named M. Schneider Trnavský Street and further down the Hviezdoslavova Street. Both squares are separated just by few metres. 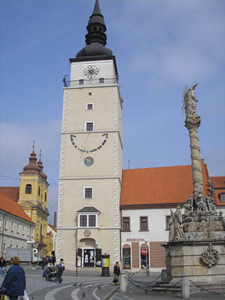 A 187 ft (57m) tall City Tower looms high over the Trojičné Square. A gold-plated Virgin Mary’s sculpture stands besides a big clock and bells on the tower top. If you climb up to a terrace, you can enjoy a beautiful panorama of this historical city. The City Tower houses a Tourist Information Centre opened all week except Sunday. Climbing the tower is accessible only at: 10.30am, 1.30pm and 3.30pm. Ján Palárik Theatre is situated at the edge of the Square. Its curtains revealed the stage for the first time in 1831. A Holy Trinity Statue towers in the middle of the Square surrounded by Renaissance Noblemen’s mansions. If you are on the Trojičné Square, you walk around the Post Office and continue along the Hornopotočná Street, you will sight the Trnava University towering on the University Square. St. John the Baptist Cathedral’s precious historical building is also located here. Constructed in 1637, it is home to some genuine sculptures and to a precious wooden altar originally from 1640. This altar is one of the biggest ones on European territory. A complex of Baroque university buildings is located just beside the Cathedral. Trnava was founded on a crossing of important trading routes approximately in the ninth century. The business and trade development significantly contributed to the town’s history. The first written record dates back to 1211. A document from 1238 bears evidence of Trnava being the first Slovak city to be awarded the privileges of royal town by the king Bela IV. The population was growing up and Trnava transformed into a large city already in the sixteenth century. An agricultural production was overshadowed by flourishing handicrafts and trade. Since 1543 Trnava has been the Archbishop of Ostrihom’s seat. It has become so, because Ostrihom (situated on today’s Hungarian territory) that used to house the archbishopric was taken by Turks. Trnava has become the Kingdom of Hungary’s important cultural and religious centre for another three hundred years. The seventeenth century brought to Trnava an education in form of the first Slovak University. It was established by Peter Pázmány in 1635. The University belonged among the most important education centres in then Kingdom Of Hungary (Slovakia formed Kingdom of Hungary’s territory at that time). The University was moved to Budín about a hundred years later. In spite of that, Trnava has become again a significant university city. Anton Bernolák who intended to codify the first Slovak standard language as well as other important and famous people studied here. Bernolák with his friends established Association of Slovak Scholarly Journeymen. The fellowship propagated enlightened ideas. The first horse railway in the Slovak territory was laid between Trnava and Bratislava cities in 1846. A noticeable industrial development started in the nineteenth century; a new sugar factory was constructed. St. Vojtech Society was established in 1870. 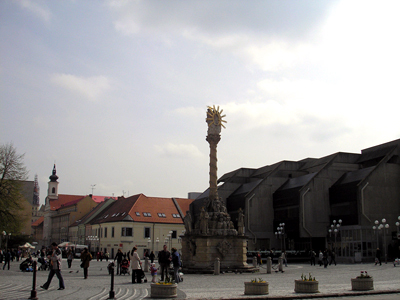 Since the twentieth century Trnava has become an important cultural and economic centre among the Slovakia cities.